Great little tent. Light weight, fitted myself, 11 and 12 year old and 2 greyhounds with no problems at all. Sturdy in strong winds and no leakages at all. Easy to put up and take down. Would have given it a 10 star but the front area would have been better sewn in, saying that it has lots of storage room in the front area and can easily fit chairs in to sit in if the weather is dodgy. Would recommended this tent. We use this tent for cooler weather rather than the big 5 man, seem cosier in the cold weather than the big one. 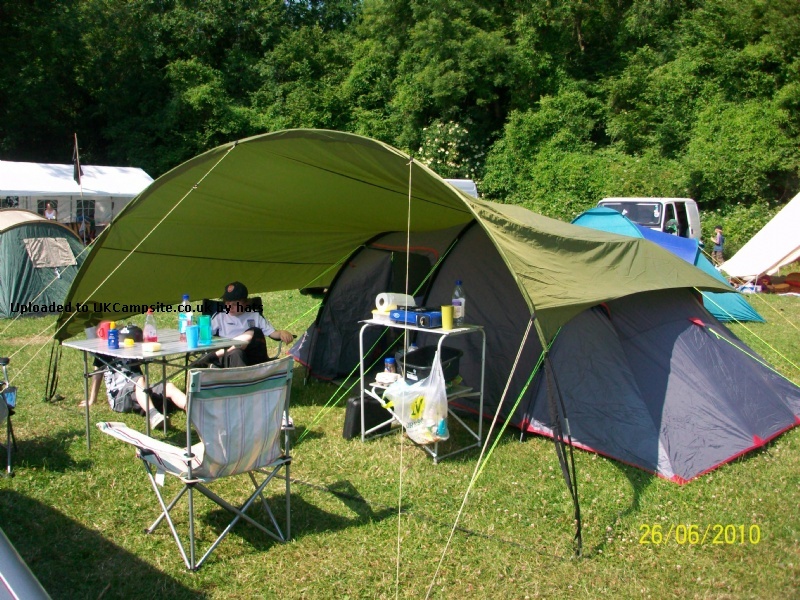 I bought this as a second tent as sometimes we don't want to take our large family tent just for one or two nights. With this can just chuck it in the car and go and it doesn't take up much space. Can be pitched quickly by one person while dealing with two small over-excited children getting in the way. Same for taking it down and packing away. Fits easily into the carry bag unlike many other tents I have experienced. Enough room for four of us in the sleeping area. Good sized porch. Held up well in heavy rain with no leaks. Would have preferred if the porch groundsheet were sewn in, like the sleeping area, as water did drip off the tent and ran in a bit through the gap during the heaviest rain, but otherwise no complaints. I love this tent. I was looking for an affordable tent that was big enough to live in but that I could put up by myself. This tent fits the bill perfectly. Really easy for one person to erect and enough room to have a chair and table in the front and move around!. Not sure how four people would manage but for me it is great. The only downside is that the joins above the door zips hold rain water and leak and I'm not sure why. A way that this tent could be improved would be to put a big window in the front so I can see out when I am sat inside out of the rain. Otherwise excellent. What a great tent we have purchased.We have bought this tent for our weekend camping.We are a family of 4, with 2 boys of 9 and 13. We wanted a 4 berth, and this has plenty of room for the 4 of us.It takes 10 minutes to put up and 10 to take down.We were up in the lake district at the weekend in heavy rain,no leaks at all.If anyone is wanting a small weekend tent I would highly recommend the Electron 4.A great buy at Go outdoors. This is a smashing little tent. It is quick and very easy to put up for a weekend. I bought it at Go Outdoors for �49 so it was a great bargain. I don't know whether it would sleep 4 plenty of room for 2 people though. It also has masses of space to store your equipment. We used it with a canopy which enhanced our outdoor space. A great buy. Swapped this for my 3 man electron as I needed bigger now the missus has decided to take camping up :) its roomy for all my needs and hight wise is not to bad our lass can stand up in it I have to duck a bit but the length is great as is the porch size I cant wait to use it :) although basically the same as the 3 man the extra space when the time comes for a family outing it will be more than welcome. Add your review of the Electron 4! With ample space for sleeping, storage and fun, the Electron 4 tent is great for four people going for some weekend or low-level camping, who want a no-fuss, trouble free camping experience.